Calculating the breakeven point is a key financial analysis tool used by business owners. Once you know the fixed and variable costs for the product your business produces or a good approximation of them, you can use that information to calculate your company's breakeven point. Small business owners can use the calculation to determine how many product units they need to sell at a given price point to break even. In other words, the breakeven point is equal to the total fixed costs divided by the difference between the unit price and variable costs. Note that in this formula, fixed costs are stated as a total of all overhead for the firm, whereas Price and Variable Costs are stated as per unit costs—​​the price for each product unit sold. The denominator of the equation, price minus variable costs, is called the contribution margin. After unit variable costs are deducted from the price, whatever is left—​​​the contribution margin—​is available to pay the company's fixed costs. XYZ Corporation has calculated that it has fixed costs that consist of its lease, depreciation of its assets, executive salaries, and property taxes. Those fixed costs add up to $60,000. Their product is the widget. Their variable costs associated with producing the widget are raw material, factory labor, and sales commissions. Variable costs have been calculated to be $0.80 per unit. The widget is priced at $2.00 each. What this answer means is that XYZ Corporation has to produce and sell 50,000 widgets in order to cover their total expenses, fixed and variable. At this level of sales, they will make no profit but will just break even. What if your sales change? For example, if the economy is in a recession, your sales might drop. If sales drop, then you may risk not selling enough to meet your breakeven point. In the example of XYZ Corporation, you might not sell the 50,000 units necessary to break even. In that case, you would not be able to pay all your expenses. What can you do in this situation? If you look at the breakeven formula, you can see that there are two solutions to this problem: you can either raise the price of your product or you can find ways to cut your costs, both fixed and variable. From this analysis, you can see that if you can reduce the cost variables, you can lower your breakeven point without having to raise your price. As the owner of a small business, you can see that any decision you make about pricing your product, the costs you incur in your business, and sales volume are interrelated. 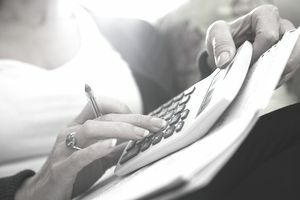 Calculating the breakeven point is just one component of cost-volume-profit analysis, but it's often an essential first step in establishing a sales price-point that ensures a profit.